Party Poker NZ Review 2019 - FREE 100% Welcome Bonus! One of the most well-known brands in poker. Great traffic leading to fun, action-filled games. Easy deposit and withdrawal options, great customer service. This Party Poker online poker review focuses on a site that is not only highly regarded in the online poker community, but popular with all levels of players. It is also one of the leading sites currently available to New Zealand players. PartyPoker.com, one of the largest and most respected online poker rooms in the world, has been operating online since 2001. In addition to poker, the site offers sports betting, casino games, and bingo. 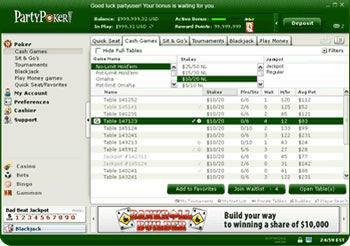 This Party Poker review covers the poker platform only and pertains specifically to the international site, which should not be confused with the separate New Jersey-based site that has been operating since November, 2013. Leading poker site run by a well-respected gambling company with lots of experience. Recent increased emphasis on social aspects of the game, making the site more accessible not just to skilled players, but to beginners and casual players. Wide variety of cash games and tournaments plus extra incentives in the form of loyalty rewards, challenges, and missions. PartyPoker.com is powered by proprietary software from bwin.party. The Borgata Casino in Atlantic City thought highly enough of the bwin.party software to choose this company as its online partner and offer a version of PartyPoker.com using bwin.party software for its New Jersey customers. Downloading the software onto your computer. 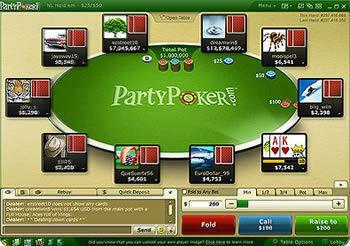 Unlike the software used by most poker sites, the Party Poker software can also be downloaded on Mac and Linux computers. Using your mobile phone or tablet to play some of your favourite games on the go. If you wish to play on your mobile device and you already have a Party Poker account, you can log in with your mobile device using the same account. 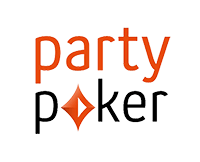 Alternatively, if you are a signing up for the first time, you can use the Party Poker app to create your account. Mobile players, like computer players on PartyPoker.com, have the option to play for either play money or real money. In addition, for your convenience, the apps include a built-in web cashier, so you can do all of your banking on your mobile device. PartyPoker.com offers separate apps depending on whether you have an Apple iOS device or an Android device. Simply go to the mobile section of the site.Then follow the instructions for downloading the appropriate app. In addition to these two apps, new for 2019, PartyPoker.com has released a third app for its popular fast forward game. Fast Forward Poker is a low stakes game which lets you immediately move on to the next hand as soon as you fold instead of waiting like you usually would for the hand to be played out. You are also immediately moved to another table. Visit http://www.partypoker.comff on your mobile device browser for more information. This app will work on most iOS and Android smartphones, but not on tablets. There is also no indication that any of the Party Poker apps work on mobile phones other than iOS and Android phones. 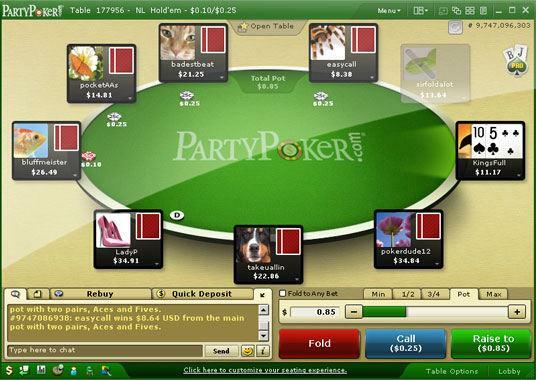 Based on the multiple ways to access the games, smooth, fast gameplay, high quality graphics, and notworthy features, like the following, we give a high Party Poker rating for software. Multi-tabling: Rather than being limited to playing just one game at a time, like on some sites, on PartyPoker.com, you can play up to 12 games at a time. Free on-site Poker School to brush up on your skills. PartyPoker.com gives you a wide choice of fast, safe, and reliable deposit methods, most of which can also be used for withdrawal. The processing time for withdrawals depends on the method, but the site has a reputation for being very fast (within a week at most and within 2-6 hours for eWallets). For your convenience, you can use NZD to make your deposits, and you have the same deposit and withdrawal options on your mobile device as you do on your computer. For your safety, all activity on your account is fully protected through the use of advanced encryption technology. These are the deposit options open to you. PartyPoker.com is a high traffic site. Regardless of whether you wish to play for free or for real money or for small stakes or higher stakes, there are always enough activity to find the game of your choice. No Limit Hold ‘Em is the most popular, with the real money cash games covering the full gamut from .01/.02 micro stakes to mid- and high limit action. Fixed limit games are also available at stakes ranging from .02/.04 to $30/$60. At least, these are the limits for computer play. Only Hold ‘Em games are offered on the mobile platform and not for stakes higher than $5/$10. Both the ring games and tournaments on PartyPoker.com seem geared for people who don’t have a lot of time on their hands, but would like to get in some quick poker action during breaks between other activities. 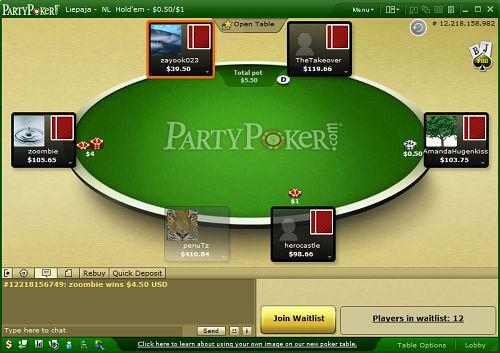 Fast Forward poker, which is played at a much faster pace than regular poker is one of the options offered for both computer and mobile play. In addition, many of the Sit & Go and multi-table tournaments are specifically designed to be very quick. Sit & Gos are a popular choice on PartyPoker.com, and recently the option has been added to the mobile platform, too. Like the ring games, they come in a variety of stakes and in both standard and turbo formats. Single table Sit & Gos range from $5+ $1 through $200 + $10. All of the Sit & Gos and most of the Party Poker multi-table tournaments are for No Limit Hold ‘Em. The multi-table tournaments vary considerably in both stakes and structure. For example, turbo tournaments, shootouts, bounty tournaments, double or nothing tournaments, and qualifiers and satellites for bigger events are some of the options. Some of the most popular tournaments, which always attract big fields, are the Sunday guaranteed tournaments. Unfortunately, other than Sit and Gos, the Party Poker mobile apps do not currently support any tournament play. A recent addition to the tournament line-up taking place 3x daily is what Party Poker calls Rapid 500 Tournaments. These are very small buy-in rebuy tournaments with 3 minute blind levels (i.e., enough time for 1-2 hands). The $50 GTD tournament has a buy-in of $1, the $100 GTD tournament has a buy-in of $2, and the $250 GTD tournament has a buy-in of $5. Hellkat tournaments, which are unique to PartyPoker.com, are another a popular tournament play variation for those who are short on time. The duration of the entire tournament is limited to 5, 10, or 15 minutes. As soon as time runs out, the chip count determines the first, second, and third place finish. In some variations of the game, in order to add an element of suspense, players are kept in the dark about the duration of the tournament until the very end. Play is super aggressive as everyone is scrambling to win as many chips as possible on every hand. Mobile players, as well as computer players, can try their luck in Hellkat Sit & Gos; the multi-table Hellkat tournaments are available only to computer players. All in all, in the category of both cash games and tournaments, our Party Poker online poker rating is favourable, but there is still room for improvement. Clearly, the lack of multi-table tournaments for mobile players needs to be corrected. Also, we would like to see more slow tournaments in which genuine poker skill is a factor as an alternative to the frenzied, lightning fast pace this site is pushing. Customer Support is available 24/7 to answer any questions you may have. Live chat support is now available in addition to phone and email support. Party Poker has changed its Welcome Bonus offers from time to time, and not only is the information reported by different reviewers inconsistent, we could not find confirmation from the website that any of these offers are currently valid. Therefore, we are unclear about whether the very generous offer of 100% of the first deposit up to $500 is still in effect. If it is, the bonus is cleared in the following manner. Every $1 paid in rake or tournament entry fees earns 2 Party Points, and every 8 points earned clears $1.00 of the bonus. Players have 120 days to clear the bonus in full. One bonus offer for new players that is appearing on the site at the present time is a $20 bonus to play “Casual Cash” games upon making an initial deposit of $10 or more. These games are only open to players who are willing to play a single cash game at a time. If you are new to online poker, or haven’t played in a while, these games seem like a good opportunity to brush up on your skills. Every time you contribute to the rake in a cash game or pay an entry fee for a tournament, you earn Party Poker points. These points, which are credited to your account immediately, can be used to buy into tournaments or redeem for cash. In addition to all of the aforementioned rewards, a weekly Loyalty Tournament is held every Sunday evening, where for a buy-in of 50 points, any player can compete for a share of the $1,000 prize pool. Another opportunity open to all players is to participate in the Party Poker special promotions. Since some may be for a limited time only and the specific offers keep changing, you should check the website frequently so you don’t miss out. The following are a few of the promotions that are currently ongoing. Three times a day, at designated times, receive extra points for your play. The number of extra points you can receive depends on your loyalty level. Each time you complete a designated mission, you receive a token to enter a special weekly tournament. Share a link to the site with your friends. If your friend clicks on the link and joins as a real money player, you both get a bonus. Despite the fact that the Party Poker international site is no longer open to U.S. players at all, it is one of the busiest poker rooms on the Internet. This assures you, even if you are limited to playing in off-peak hours, that you will find the action you are looking for. At any given time, up to 9,000 players might be logged on playing cash games and up to 60,000 logged in playing in a tournament. PartyPoker.com used to be a tough place for a beginner to make a profit, but that isn’t true anymore. These are some of the factors contributing to the change. Continual influx of players from the casino, sports book, and bingo room, many of whom are poor poker players who play very loosely. Heavy tie-in with social media and player reward system based on completing designated “missions.” Sharks and grinders are not into these activities; they simply want to play poker and take your money. Recent advertising targeting casual players. Thus, it is not surprising that PartyPoker.com is sometimes called the Aquarium, because of all the “fish.” This is particularly true for the lower stakes games where beginners have the opportunity to play against others at their level. However, as you move up in stakes, the level of competition gets tougher. PartyPoker.com is committed to providing a safe and fair online poker room. The site carries the eCogra seal of approval, showing that it meets this organisation’s very high standards for security and fairness. PartyPoker.com has zero tolerance for any form of cheating or collusion. The purpose of this Party Poker online poker review is not only to convince you to play by describing what is great about the site, but also to express our opinion about what would make our Party Poker online poker rating even better. Clearer indication on the website with regard to exactly what new players signing up for the first time can expect to receive. If a Welcome Bonus and/or freeroll invitation is being offered, it needs to be described in detail. Mobile app upgrades to make them compatible with more devices. Greater game variety on the mobile platform, including tournaments, along wth higher limit cash games. More tournaments with deeper stacks and longer blind intervals (which are a much better measure of true poker skill) than super-fast tournaments. Our overall Party Poker rating is very favourable. We like the fact that this site uses innovative methods not only to distinguish itself from the competition, but also to make the games highly appealing to recreational players. Old school players might be put off by all the hoopla and fast and frenzied action, but young people who see poker and partying as the perfect mix will love PartyPoker.com! play now Sign up at Party Poker today for an a 100% welcome bonus!